My three-part goal for the start of June MOOC-sparked blogging? 2. To select 5 links to recommend as spurs to thinking about course (re)design – whether we’re teaching in campus classrooms still equipped with blackboards & chalk trays, or in rooms with some wireless access where we might conducted courses with inverted or hybrid or other eLearning/media rich elements, or from within fully MOOC’d or OOC’d capacities. 3. To write a post that sketches why/how the select resources would be useful to course (re)design – again, whatever the course delivery location, mode or platform. A bit of thinking aloud / allowed in the company of thoughtful peers. I. How Might We Learn from MOOCs in Setting Up “Learning Management Systems” More about Learning than Course Management? To whatever degree we incorporate eLearning, the courses we design need a “hub” – a place from which, minimally, we are ableto share resources with students, to collect assignments for teacher & peer feedback & assessment, to house & support assessments, and to serve as a springboard for fostering conversation among participants. both by Justin Reich, co-founder of EdTechTeacher, director of Facing History and Ourselves, and fellow at the Berkman Center for Internet and Society. I think here of how I use Moodle (or Blackboard or D2L) now, whether for a primarily face-to-face, hybrid or online course. Here, teachers might look at an existing MOOC to discover ways others have folded together discussion before and after the viewing of short presentations, or to consider when and where and why course designers have opted to advance discussions by having students synthesize comments as well as advance new questions, or by taking on that role, or by sharing that role across modules. I think here of the modules I’ve completed to learn about eLearning practices and resources in the context of this campus, or to muck about in exercises highlighting upgrades to Moodle. I also think about the potential here for setting up a MOOC platform to function as a course textbook – a bit more need to play around to determine whether I could meet my goal of making a course “textbook” of ereadings and other digital resources fully accessible to adaptive software as part of universal, accessible design. Here, teachers might look to MOOCs to discover the small modules within MOOCs colleagues have created to populate these platforms and courses with stand alone segments that support student learning of core concepts that may have been “covered” in prerequisite courses (taken long ago, if at all, by participants) or that would provide important but not essential contextualizing or further information related to the core concept. I think here of colleagues who curate LMS and blog-platform spaces in order to share Open Educational Resources they have shared, as well as of smaller university-linked OOCs that provide via ongoing “enrollment” options a high level of open access to content generated by developers and participants. Here, teachers might consider ways of “wrapping” a course around a MOOC or smaller OOC created by colleagues, integrating an existing MOOC into an on-campus course as part of an inverted/flipped approach to course design to support hands-on student learning. II. 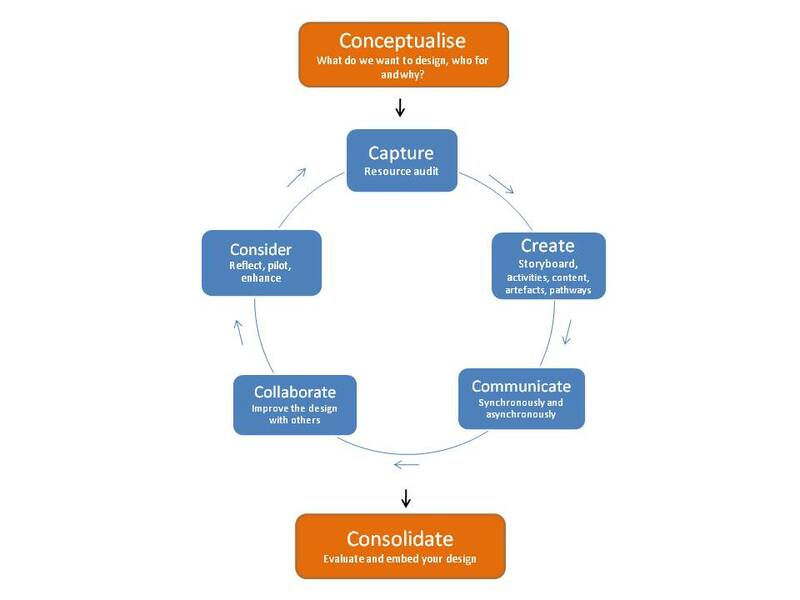 How Might We Draw on eLearning Frameworks in the Design of Courses to Support Learning? – as a first stage of thinking about course design? And how to do ideas from MOOC design link into design considerations from the start – as a spur for conceptualizing? Within her “New Classification of MOOCs” post, Conole offers a dozen design dimensions that can be used – I would propose – to build courses, especially eLearning/media rich courses, as well as to assess effectiveness or discern educational purposes of a particular MOOC. 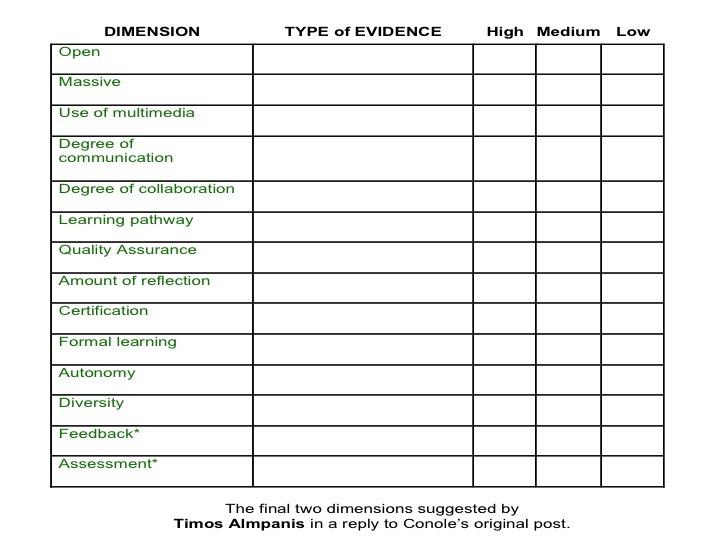 These dimensions – plus two – are noted along the left column of the chart below with additional explication set out in Conole’s post (to be updated at the end of this week). For course design purposes, I’ve linked this listing to two other considerations Conole addresses: what Types of Evidence a course evaluator would find of the particular dimension within the work completed by teachers or learners, and to what degree the particular dimension is found within the course. So, for example, in starting to redesign my own “Teaching in Higher Education” along the dimension of Open, I see that the teaching materials are semi-open at the moment: Anyone with the link and a university password can access teacher-prepared materials, which are hidden behind the password in order to comply with document copyright attached to course readings from proprietary journals. The student materials are also semi-open as these are share by students with audiences they choose from within the Google suite of applications. Our online discussions are sometimes conducted via blog posts and replies but more usually the same access as the course materials. So, open? Low to Medium. Do I see a change ahead? For teacher-generated materials, yes – a move to High. Which may also make those materials more “Massively” available via social media dispersion. Which has me re-thinking how I use media – which ones? why? for which purposes and audiences and tasks? by “world renowned experts on MOOCs,” beginning 8 May and running through 31 July. with an emphasis development of personal learning networks via discussions as often occurring in dispersed social media spaces as in discussion forums operating within an LMS hub. MOOCs offered via commercial courseware providers generally more “formal” in that the platform itself will “contain” the course materials – including “products” created by teachers and students – and make these available only during a designated time frame and only to registered participants. In this case, then, the MOOC can be call formal, and its contents viewed as proprietary. Given the active/interactive learning and teaching orientation that many TILT readers pursue, in addition to browsing and perusing Coursera or Udacity or Futurelearn course catalogs, check out the List of Current and Future Connectivist MOOCs to find one or two that could “muse” your course (re)design creativity this summer. ** The 7Cs set out in Current Thinking on the 7Cs of Learning Design map nicely onto the backward, aligned course design practices regularly addressed in posts to this blog. Essentially, the process of thinking, writing and drawing through the seven pieces provides a robust foundation from which to begin the building work of backward, aligned design. And, in my experience, walking away from the computer to write and draw – conceptually map or storyboard – ideas makes for a decidedly more rich set of ideas.